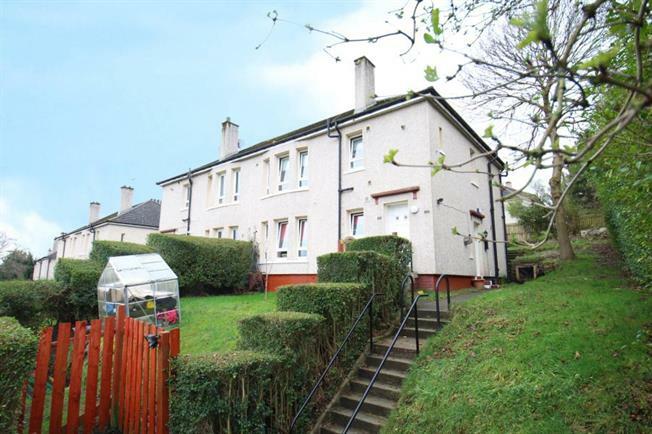 2 Bedroom Cottage For Sale in Glasgow for Offers Over £75,000. Slater Hogg & Howison present to the market this well presented two bedroom lower cottage flat set within a much sought after residential locale. The subjects offer welcoming reception hallway providing access to all main apartments. Bright spacious bay windowed lounge, modern kitchen with wall and floor mounted units and matching work tops, beautifully tiled modern three piece bathroom with shower over bath. Two excellent sized freshly decorated bedrooms. The subjects also offer gas central heating and double glazing. Private front, petitioned rear garden and on street parking to front. Inverleith Street is well situated for local shopping which can be found on Edinburgh Road and for more extensive shopping there is an Asda Superstore based at the Forge Shopping Centre. There is schooling within the area at both primary and secondary level, transport links include a bus service which gives access to the City Centre and surrounding area which have a host of bars, restaurants, cinemas, universities, theatres etc. There is access to the M8 motorway network system within one mile of the property also.